Last week I had the pleasure to submerge myself in the rainy, flat, yet beautiful landscapes of the Netherlands. Yes, nature has entrepreneurs too, they are called pioneer species. 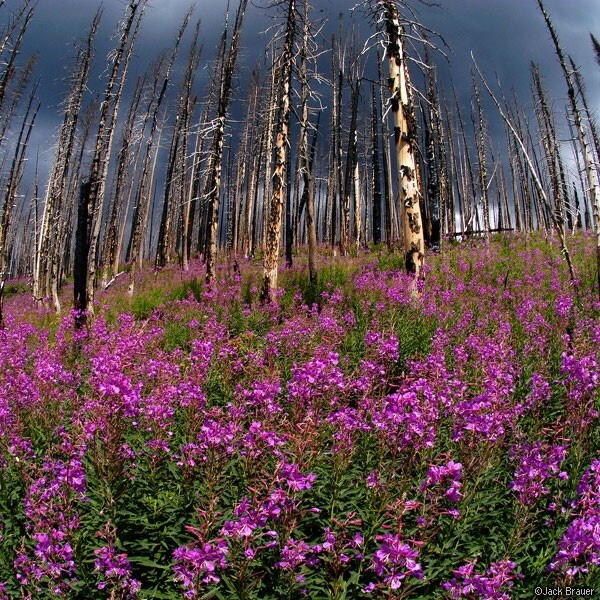 Fireweed, a pink flower that appears as first after a huge forest fire, is one example. They are the species that are the first colonizers of harsh environments and are the drivers for ecological successions that ultimately lead to a more biodiverse and stable ecosystem. Almost daily a new article appears in which tips are exposed to obtain a healthy work/life balance. Well, if we follow nature’s advice, we could keep trying to find it, but in nature there is no such thing as a “balanced” state. Although the overall appearance might seem in balance, the truth is that this is the result of a “dynamic non-equilibrium” or a constant flow of states to come as close as possible to equilibrium. One of the main reasons: (natural) disturbances will occur, no matter how hard you try to avoid them. So, what is the best way to cope with this “stress” of having to deal with (unexpected) disturbances that throw you in unbalance? One is most resilient when being a “generalist” rather than a “specialist”; or in other words: don’t try to be extremely good at one specific thing. Translating this to ourselves: If work becomes so dominant that you develop your personal skills almost only in your field of work (e.g. becoming extremely productive at managing your work, or being an uber smart coder — usually “hard” skills), you will have a very hard time to enjoy your non-work life (e.g. spending a relax time with your family — usually “soft” skills). Nature’s advice is to develop both your hard and soft skills so that you more easily can adapt to either your work-self or your life-self. By the way: just the fact that we call them “work” and “life” is already a sign that something is totally wrong. You should be alive at work. Perhaps the most shocking news from nature: as a pioneer you only have a very temporary role to play. You are the one to appear as first since you are able to withstand those harsh conditions that others can’t. You can withstand the hard winds, the low nutritious soil, or the high currents. Even better, you thrive in them, making you grow fast and reproduce in high amounts. Together with your peers of pioneers you will change the conditions of your environment, you are making them more accessible for others to come and stay. But as soon as they have arrived, your role is to leave space for them, and find a new, underdeveloped area. Seems like there is a good reason why you see so many serial entrepreneurs. If you are good at seeing new business opportunities and making them viable, perhaps your role should be just that. Why stay at one place and try to compete with the next generation (e.g. managers, CEO’s)? Can you accept that others are better at growing your business idea? If so, you might have found your best talent and will enjoy to plant many new seeds and let them be grown by others. As a pioneer you are the first to colonize, but you are not there to stay. Being able to thrive in harsh conditions your job is to fix the sand or soil, to make nutrients more accessible, to enrich the soil, to create shelters from hard winds, etc. Suddenly other species will find out that the harsh conditions changed, and became viable to them. They will start settling and as they are better in other things than you, for example they need less resources or they are better at making friends (called mutualistic relationships in nature), they will take over. The end stage of ecological successions is a stable, biodiverse ecosystem, like the redwood forest and coral reefs. Change in nature is accepted as a good thing. ii) change itself, which indirectly affects the environment; e.g. coral needs CO2 to grow, taking it from the sea water thus creating a CO2-poor environment around the corals. How can we apply this to ourselves? As an entrepreneur you can introduce a new product into the world, which creates an entire new market. Think cars, mobile industry, and computers. Or you can change yourself, affecting your environment. Examples that come to mind are: Not believing that the world is flat, literally throw our world upside-down. Or the fact that industry is now becoming more and more circular thanks to those thought-leaders that couldn’t accept our linear thinking and realized that “waste” doesn’t exist. In both cases, what you are doing is preparing the environment to attract followers that usually will take over and be the ones to make the actual long-lasting change. If your startup doesn’t make it into a real company, that doesn’t mean you failed. On the contrary: you set a new stage for others that are perhaps better at running a big company, but you sure made a difference! Familiar? What happens is that you are sending messages that aren’t perceived by the other. Although you might think your partner heard you mumbling, he probably hasn’t. As he is watching an interesting TV show he didn’t even noticed that you were so hungry. He already knew dinner would be ready in 15 min but didn’t realize he should have told you. There are many great examples in nature where a specific message is perfectly aligned between the sender and the receiver. 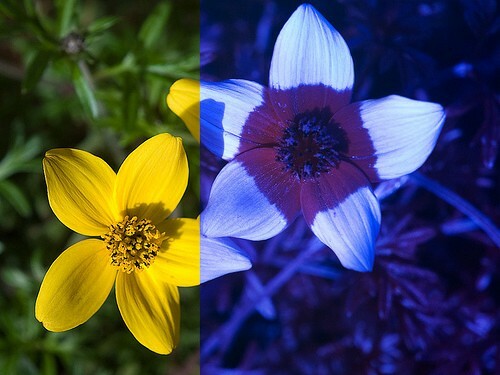 Flowers not only send out a yummy smell to attract bees, they also have a beautiful UV pattern that shows them the way to their nectar. We as humans don’t see UV so these patterns/message would be totally useless if it were to guide us. Daphne and I road tripped to Chicago this past weekend. By the end of the six hour drive we were a bit loopy, entertaining ourselves with a google search of “fun riddles.” Considering English is Daphne’s third language after Dutch and French, I was astounded by how quickly she solved all of the wordplay riddles I threw at her. It’s true, I’m the only American in this first cohort of Biomimicry PhD students, and definitely the linguistic underachiever of the group. Bill speaks Mandarin Chinese in addition to English, and even translated a TEDTalk given by Janine Benyus on Biomimicry into Traditional Chinese on TED.com to expand access to this exciting discipline. Anyway – back to our trip to Chicago! 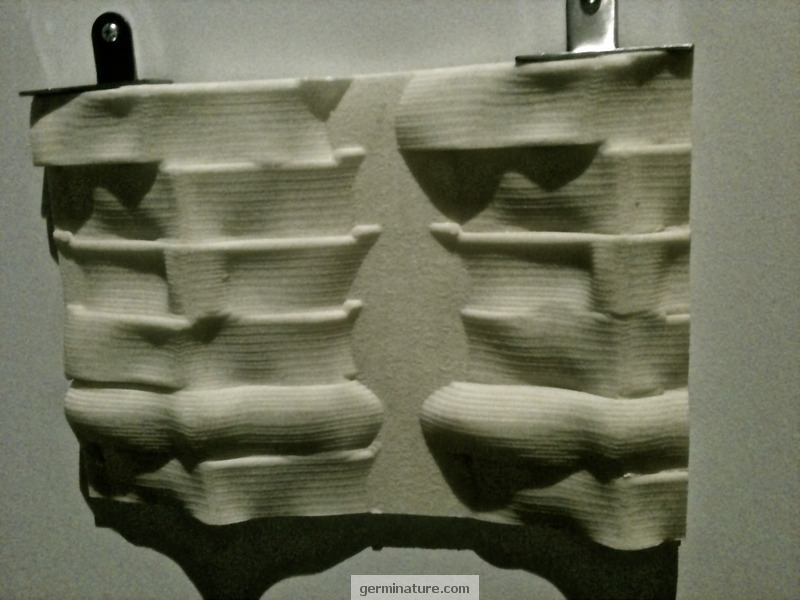 On October 20th Daphne and I visited Chicago’s Field Museum to check out a temporary exhibit called Nature’s Toolbox: Biodiversity, Art, and Invention presented by Art Works for Change. There were some very interesting pieces. My favorite was an experimental short by Catherine Chalmers titled Safari. I like how she played with scale, helping us see the world of insects in a whole new way. It reminded me of the work of Ann Hamilton, an acclaimed visual artist who visited UAkron earlier this fall to discuss her vision. Today we visited the Cleveland Metroparks Zoo to do a “genius of place” exercise. Genius of place is the idea that organisms in a particular environment can teach us much about the mechanisms, processes, and systems best-suited to that set of environmental conditions. For example, the Namib desert beetle has nanoscale bumps on its wings which allow it to harvest all the water it needs from morning fog. What an excellent design for water collection in dry, high temperature desert conditions! Daphne and I visited Old Trail School in Bath, OH, this afternoon. The school teaches grade 2-8 and is located within the perimeter of Cuyahoga Valley National Park. Given its place-based assets, it’s fitting that curriculum emphasizes the value of local natural resources, and encourages sustainable practices. The school’s wastewater treatment system, the Hybrid Wetland Living Machine®, is one of only a handful of its kind. Wastewater is filtered through three types of wetlands which purify it to a grade safe for discharge into a nearby tributary of the Cuyahoga River. The greenhouse that houses the wetlands, doubles as a Living Classroom space for environmental education, and has a really cool turtle and fish pond! The purpose of our trip to Old Trail School was to visit a 4th grade class, and test the theory that young children are more imaginative than adults because their approach to a problem is fluid and adaptable (at least until “school kills creativity”) On the other hand, an adult’s approach to a problem might be standardized by professional experience. For example, in a business environment employees are trained to plan-and-execute, and in the process, forget the value gained through playful brainstorming and rapid prototyping. Tom Wujec elaborates on this phenomena in this fascinating TED Talk. We wanted to explore the creative process of children and seek to emulate their open mindedness. As biomimicry practitioners, having an open mind helps us make imaginative leaps from biological model to abstract design principle.